This innovative calculator helps students keep track of equations and visualize their steps. The large LCD screen displays multiple calculations and answers simultaneously. 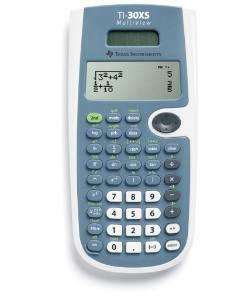 The calculator uses symbols and styles that students would use in hand-written work. Users can scroll through, review, and edit current or previous entries with ease. TI-30XS includes a function table and data/list editor. A toggle key shows students fractions and decimals in alternate forms. Ordering information: Calculators are sold separately and as a teacher kit, which includes ten calculators with yellow backing, a storage caddy, poster, a set of instructions, and a "School Property" label.